The Victoria Sovereign is arguably the most iconic gold sovereign in all of its almost 600-year history. 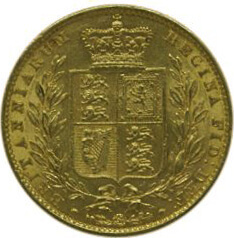 Dating from 1838, the coin’s design had to be changed when the British throne split from the Hanoverians due to their refusing to recognise a woman as a monarch. Pistrucci’s famous St George was replaced but the figurehead of the monarch remained. By the middle of the century, the Queen Victoria Sovereign had become ubiquitous, with almost 100m produced and in circulation. This was partly fuelled by the gold rushes of the mid-century in places such as the United States, Canada and Australia. By the end of the century, the sovereign was “Coined” the “Chief coin of the world” due to its purity and overall quality of minting by the Royal Mint itself. The latter part of the century also saw the return of the Pistrucci’s St George and dragon design in a bid to make the coin appear more attractive, which was approved by Queen Victoria herself. This was somewhat ironic as King George III, the monarch’s death that the Italian was originally honouring, despised the artists work. By 1887, the depiction of the young Queen Victoria was changed to reflect the monarch’s age and was designed by Sir Joseph Boehm. This in turn was changed again by what has been called the “Old head”, designed by Sir Thomas Brock and introduced in 1901. Queen Victoria’s death in the same year to another change in 1902, with the figurehead of Edward VII added. 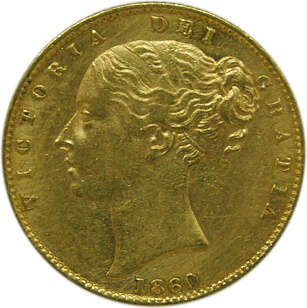 The standard Victoria Sovereign itself has a purity of 22 carats, a gold content of 0.2354oz and weighs 7.98oz. This makes it one of the purist mass produced gold coins of its era, helping it to retain its value ever since and making it a highly popular coin for collectors and investors.